Bring water and milk to the boil in a saucepan. Add the oats and allow to simmer for 8-10 minutes. Slice the banana in half, mash it and add to the simmering oats. Add the vanilla and Cacao Maca Boost and stir well. Once thickened, pour the oats into bowls and top with the remaining banana and berries of your choice. It is World Health Day on the 7th April and World Allergy Week from the 13th – 19th April this year and so we are promoting Health Awareness in April. Symptoms of food allergies and intolerances can negatively affect a person’s health and quality of life. Intolerances to gluten and lactose are common; however symptoms can be prevented with the use of suitable gluten- and lactose-free alternatives. Ancient grains have been planted and harvested the same way for thousands of years and are minimally processed. 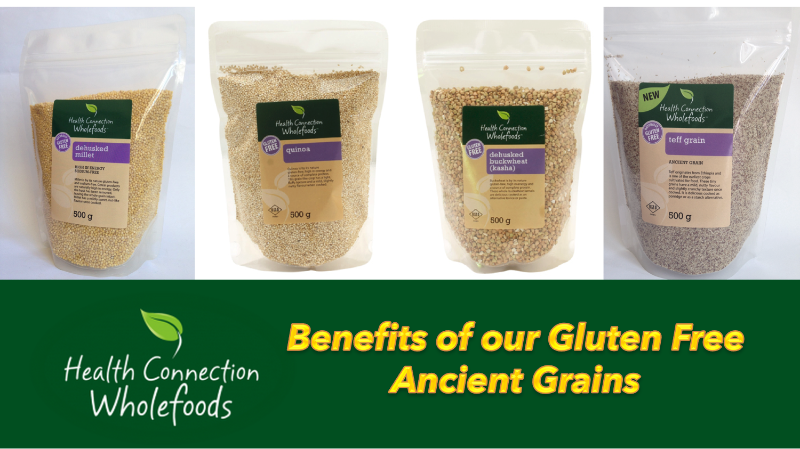 Ancient grains are usually wholegrain and high in fibre, which is important as many people following a gluten free diet don’t eat enough fibre. Buckwheat, quinoa and teff are sources of complete protein, providing 5-7 g protein per serving. The protein content of a food can help to lower its glycaemic index. Quinoa and teff are also sources of magnesium which helps avoid muscle cramps. The prices of gluten-free ancient grains vary to suit all budgets. Millet and teff are the cheapest at about R2.30 per serving, quinoa is the most expensive at about R8.80 per serving and buckwheat is priced between them at about R3.30 per single serving (based on average retail prices and assuming 500g provides 10 single servings). Click the links if you would like to purchase any of these items online! butter, cinnamon and half the dates and stir well.